With a huge roar (in marketing speak), Simba, Timon, Pumbaa, Rafiki, Mufasa, Nala and Scar all finally come to DVD in what is sure to be the biggest push forward for the format yet. This holiday season sees the releases of some of the biggest and most anticipated discs ever, not least the Indiana Jones Trilogy, updates to Disney’s own line of collectors’ Treasures tins, and of course the movie that only recently surpassed The Lion King itself as the most popular animated feature of all time, Disney/Pixar’s Finding Nemo! 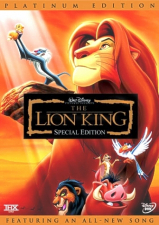 Although Nemo may have passed Simba in the theatrical box office stakes, chances are that in the home, the King will keep his throne, with millions of VHS tapes already sold, not to mention the previous LaserDisc release, both in “vanilla” movie-only form, and as a deluxe box set full to the brim with bonus materials, being firm favorites with fans. Now it’s all happening again, with Disney’s biggest marketing push for a movie on DVD so far. So, was the wait worth it? On first eyeing up the back cover, it seems this one may be a little slim on the two-disc extras – but wait! Inside there’s another list of bonus features that announces the set has “More to see than has ever been seen, more to do than has ever been done”. While I’m still not so sure that this is the case (we’ll get to the extras later), it seems that this is the definitive version of the movie on disc. 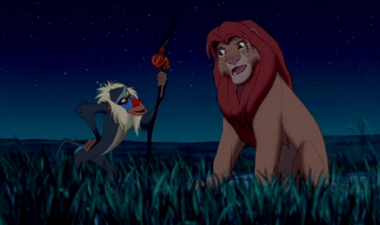 First released to theaters in 1994, The Lion King was definitely what one could call a “sleeper hit”. During production, the story went through re-write and development hell, then-Studio head Jeffrey Katzenberg lost what little faith he had in the project towards the marketing push (he is on record as complimenting his animators with the half-hearted remark that if the film grossed $50 million, he would be happy and it wouldn’t be their faults), and management had barely signed off on the film before moving on to what they truly perceived to be their jewel in the crown: Pocahontas. Then, suddenly, something happened. Audiences flocked to the film. Parents, who had taken their kids, went with other parents. Kids went back for second and third viewings with other kids. The audience that had built up during the 1990s animation renaissance of Beauty And The Beast and Aladdin came back again and again – Disney animation had another smash hit, though one so big that it proved to be a blessing and a curse. 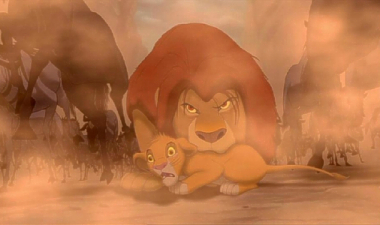 Although the huge success of The Lion King paved the way for more research and development into animation technologies and the beginning of the animation toon-boom that saw rival companies Warner Bros, Fox Animation and, later, Katzenberg’s own DreamWorks enter the fray, it left Disney with a much bigger problem – namely, how to top it! The Studio has proven itself both its best friend and its worse enemy, trying to extract all the best elements of The Lion King and duplicate them in stories that do not necessarily fit the same mould (Pocahontas, Hunchback, Atlantis and Treasure Planet). As we all know (and I’m not going to start another online rant here about the state of classical animation), it’s time for such artists to get back to basics and to stumble across the next big thing by accident – exactly how The Little Mermaid, Beauty And The Beast, Aladdin and The Lion King itself proved. As for the film itself, can there be anybody out there (and especially reading this review) that has not seen it? It’s the biggest animated film of all time, seen by many more actual people than its nearest rival Nemo, and the incidental instigator of the direct to video sequel (let us not forget that, while The Return Of Jafar was released first, it was merely the first four episodes of the Aladdin TV show strung together, whereas Simba’s Pride was fully designed for video from the outset and given a limited theatrical release). Regular re-runs on The Disney Channel and a spin-off sidekick show based on Timon And Pumbaa means that at some point everyone has come into contact with these characters. The story itself is one that has been told time and time again but works so well, from the settings and the characters, to the situations, events and pay-offs throughout that make the film a classic. The Lion King is a strange one for me, as I do have to be in the right “mood” to sit and watch it. I am constantly amazed by its visual delights (I nearly passed out with giddy excitement when I first saw that glorious pan around the top of pride rock as Mufasa explains the facts of the Circle Of Life to young Simba!) and find the score to be a revelation from both Elton John and lyricist Tim Rice, but overall the film lacks the broad knockabout humor of Aladdin, or even Beauty And The Beast. Yes, it’s a drama, of course, and one mostly inspired by Hamlet (I’m not going to mention Kimba and stir up that old chestnut again), and is a different type of film to the examples just given, but I do find the ending to be unexceptionally drawn out, especially after the stunning sequences such as Be Prepared, the stampede and Can You Feel The Love Tonight. Getting past personal viewpoints, The Lion King is a very decently made film that can truly be advertised as suitable for the whole family (adults included). Yes, there are scary moments (though not as scary as when the Witch offered Snow White the apple when I was only four years old! ), but it sticks to the tried and tested formula that good will always win out over evil. Simba is a likable hero, the sidekicks know their place, and the villain, while not terribly active, plays delicious mind-games. Production-wise, it is simply sumptuous, with the kind of Deep Canvas imagery on show that was all created before the actual advent of Deep Canvas itself! I’ll not bash on about the integration of the 2D and 3D modelling (you know it all anyway, and if not, it’s all on show in the set) suffice to say that this is still one of the best looking animated features from any Studio out there, knocking the spots off of the competition of the time (and since). Everything about The Lion King, from the voice talents to the date of release, fell into place with a magical karma that could never have been planned to perfection. 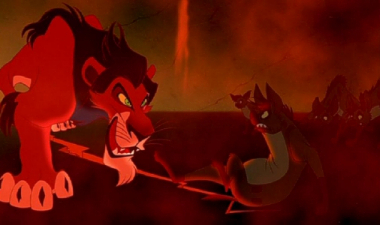 As mentioned above, Jeremy Irons provides Scar with the hiss-able quality that we love in Kaa the snake from The Jungle Book, while the other voices (made up from a wide spectrum of creeds and colors) just work in a way that no other feature can boast. Rice and John’s songs opened up an entirely new way of including music in a musical: I’ve seen the Circle Of Life opening so many times now, but one must never forget that this is what inspired the “narrative song voice” of the later Toy Story films, Tarzan, and DreamWorks’ The Road To El Dorado (also penned by Elton John). First off, let me first say that I am sooooo glad that I held on to my Lion King LaserDisc box set, and so will many others who have that original box. For it’s almost-tenth anniversary re-issue last Christmas, The Lion King was given a Beauty And The Beast Imax style makeover, meaning that certain sections were reanimated to give more expression than was originally possible (or intended) back in 1994. While the set announces that two versions of the film are available (the new SE cut and the original theatrical edition), it’s another case of Beauty And The Beast, where the original cut is, in fact, the newly animated version, but minus the new song. Confused? Don’t be – the purists among us out there will belittle this fact until the cows come home, whereas the rest will just notice that the crocodiles in the Can’t Wait To Be King sequence may look a little differently to what they remember from their VHS tapes. Anyway, with that gripe out of the way, let’s move on to the extras proper. First up, on Disc One, we’re “treated” to the usual barrage of Sneak Peeks for upcoming Disney product. 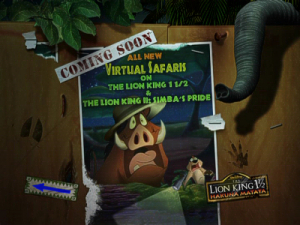 Also accessible from the main menu, there are trailers for the next sequel Lion King 1½: Hakuna Matata (which doesn’t mention its DTV origins, simply stating “coming 2004 from Walt Disney Pictures”), and a theatrical preview for Brother Bear (featuring pencil test animation – couldn’t they put the most recent trailer on, considering that the reason The Lion King was brought forward for release this year was to push this new movie?). Trailers also play for the upcoming video releases of George Of The Jungle 2, Finding Nemo, the actually quite dreadful-looking Santa Clause 2 (nice make-up job though!) and a shameless Walt Disney World promo. Buried in the menus is a surprisingly grainy (perhaps as it’s full screen?) additional push for the Sleeping Beauty Special Edition, as well as a 40th Anniversary 2-disc announcement of a Mary Poppins Special Edition! After the previews, the main menu kicks in with an amazing bird’s eye view of the Pride Lands. 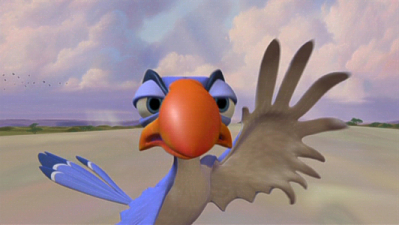 Sweeping through 3D versions of the film’s backgrounds, it’s an awesome sight, only slightly marred by the first sighting of a CGI Zazu – another demonstration as to why 2D characters do not work in three-dimensional animation. After the initial shock, one gets used to our CG host pretty quickly, even though character originator Rowan Atkinson does not voice him. Zazu intros us to the various places to “visit” on the disc, which include the Set Up and Scene Selection options. Here is where you’ll also find the choice of which version of the film to play. Rather awkwardly, only the SE cut has a chapter menu, while the Audio Commentary Track is only playable on the OT (so called “original” theatrical) cut. LaserDisc owners will have a huge feeling of déjà vu when listening to this track – it’s the exact same one as from the 1995 box set. While it’s a great listen – one of my all time favorites in fact – and has producer Don Hahn as well as co-directors Rob Minkoff and Roger Allers in a wonderfully affecting up beat mood, their comments only reflect the “one year on” nature of the recording. Although they do go into detail on the behind the scenes aspects, pointing out the origins of the film, stories about the production as well as mistakes (now cleaned up for this new DVD), there is nothing on the subsequent stage success, restoration or Imax re-release. Nothing new here for those who have heard this track before (we have to wait until Disc Two for more elaborations), but those coming to it for the first time will be enlightened and entertained. In “Grasslands” there is a brief three-minute look at the Making Of The Morning Report sequence, which goes to great pains to imply that it was an idea that was abandoned way back in the original’s production. Everyone is all for it, of course, although this fluff piece does nothing to really warrant the inclusion in the actual film. Also in Grasslands, there’s The Lion King Personality Profile Game, a simple question and answer session that tells you how much like a given character from the film you really are (I was Simba)! At the Tree Of Life, Rafiki takes over to offer three choices: the Hilary Duff/Raven/Disney Channel kids cover version of Circle Of Life, a Making Of The Video clip, and a Sing-Along track. The four-minute full-frame music video is accomplished enough and the music production up to scratch, but the kids don’t really have the maturity to pull off the lyrics, and I couldn’t help but giggle at some of their attempts to emote. Still, better than it being just a thirty second commercial, though it does inevitably promote the new DisneyMania 2 album at the end. Making The Video is a pretty lengthy clip (another four minutes, but feels longer) on the production of the song, featuring interviews with the performers. It’s an okay piece, snappily edited, but ends up giving too much weight to what should remain an add-on curiosity. The Sing-Along track merely plays the film through (in either the OT or SE cuts) with a subtitle track highlighting the song lyrics. In the Jungle, Timon and Pumbaa invite you to play the set-top games Grab A Grub, a set-top point the menu arrows to catch the bugs diversion, and Sound Sensations, where a sound from the jungle is played and the player must use the remote to select which animal they think makes it. Not terribly engaging, this is obviously aimed at the smaller set, who will have plenty of fun. Things get a little more interesting for fans and adult viewers with a slim selection of Deleted Scenes, in the Elephant Graveyard. 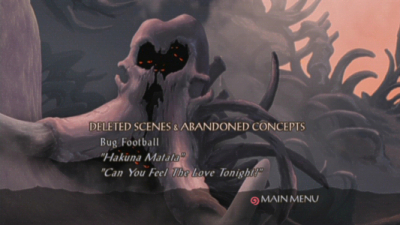 Three are presented in all: Bug Football, Timon’s Hakuna Matata verse, and an alternate version of Can You Feel the Love Tonight. 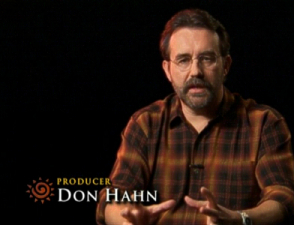 New for DVD are introductions from producer Don Hahn, though these are the same selections as found on the LaserDisc set, being a mixture of mainly storyboard rough cut reels, with a little pencil test animation finished on some shots. The Can You Feel… section is lifted directly from the LD, complete with Elton John and Tim Rice’s comments from 1994. Not included here is the alternate (and very nice) choral version of Can You Feel – another bonus for those LD owners! On to Disc Two (or “2 Disc” if you believe the label print!) and thankfully there is no copyright warning screen or other hold-ups – straight to the main menu, introduced by Jeremy Irons. The features on this disc are accessible in a multitude of ways, making something that should be pretty simple quite complicated. 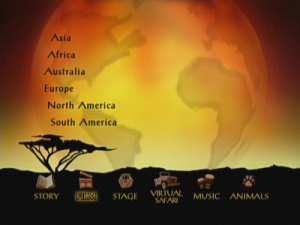 One way is to venture into one of six “continents” to find out about the film and how it came together from various places around the world (for instance, Africa will play clips on the African influences on The Lion King, from the initial research trip to character design, while Australia plays the 1½: Hakuna Matata trailer again, as that is where the film was animated). My preferred and more logical choice was to follow the icons at the bottom of the screen, though even these miss some crucial clips that one still needs to explore the Continents to find. Divided up into various sections, this makes for an easier way to make sure one doesn’t miss anything. First up is Story, which leads to three featurettes that cover Origins (in which the filmmakers really talk up the inspirations for the overall plot), Timeless Themes (which elaborates on the origins) and The Story Comes To Life, which follows the initial scripting and development. Lasting 12 minutes, these clips set up the documentary approach that the video-based extras take, as the viewer explores the production. A “Play Journey” option works as a play all function, with all the clips in a given section playing as one. In Film, there are several more clips, totalling over 35 minutes. Origins brings us insights from the filmmakers, those from Disney’s past and present (but no Katzenberg, though he’s seen in archive) and Leonard Maltin, as they discuss the beginnings of the movie and how, at first, it was seen as the poor relation to what was supposed to be the Studio’s big leap forward, Pocahontas. The Production Research Trip shows the team as they decamp for Africa, picking up influences for use throughout the film. A nice clip, we see the crew’s own photographs as well as video footage matched up to the images that made the final film. Art And African Influence delves deeper on this subject, showing the colors and styles of Africa and the way the team adapted the atmosphere into the visual development, especially the Can’t Wait To Be King sequence. Reflections has everyone looking back on the success of the film in theaters, while Storyboard Process is a 1994 clip that explains how these story aids play a big part in the development of an animated film. 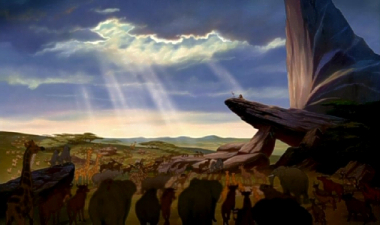 Production Design, another 1994 clip, has Andy Gaskill talking about the approach to the “look” of the film, and Character Design has several mini-clips ranging from 30 seconds to two minutes that explore the animators and characters of the film, including Mufasa, Simba, Scar, Rafiki, Timon and Pumbaa, Zazu and the Hyenas. 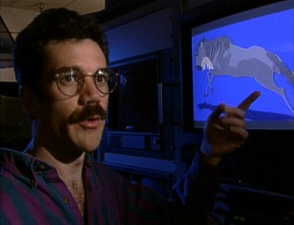 Directly ported from the LD, Computer Animation is an in-depth exploration of the wildebeest stampede, from the initial hand-drawn design of the animals, to the full color and sound of the finished sequence. Finally in this section, is a chance to step through the Character Design Galleries for all of the principal players. The Music section takes a look at the much-publicised contributions of Elton John and Tim Rice, in a combination of archive and new interviews. 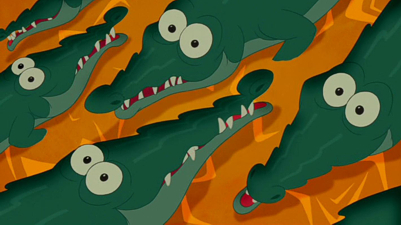 In Musical Inspiration, the filmmakers gush about the five songs written for the movie, while Landmark Songwriting is a chance to pat Elton on the back for the tunes he composed (this also includes the original crocodile animation from the Can’t Wait To Be King sequence). Orchestral Color and Scoring Emotion both take the opportunity for Hans Zimmer to explain his contribution to the film’s score, which I actually found very interesting, as Zimmer talks a lot of sense here. African Influence and Audio Sequel both explore the talents of Lebo M, and his combining with Zimmer to bring the rich African sound to the music of the film, as well as the Compact Disc album Rhythm Of The Pride Lands, which was the first extension of the Lion King brand. Full Circle wraps up this section, with all the major contributors talking about their experiences on the film and how proud they were when it went on to win Oscars for Best Song and Score – over 24 minutes of features that build on what was available to the compilers of the LD box, this is good stuff. 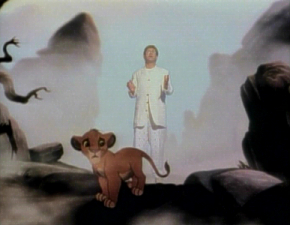 Rounding out the Music option are three full-length Music Videos, for Can You Feel The Love Tonight (the original Elton version, which places him “inside” the film), Lebo M’s Hakuna Matata (from Rhythm Of The Pride Lands) and Circle Of Life (John again, with the film’s hit single). Stage follows the progression of the film from the screen to the hit Broadway musical. Musical Origins explains the initial ideas to move Simba and co to the stage, and the Studio’s decision to bring theatrical director Julie Taymor on board, who is widely seen as responsible for the whole re-imagining of the story and making it work as a theatrical experience. The five featurettes included here (the others are Screen To Stage, Musical Texture, Setting The Stage, and Leaps Of Fantasy) make up another 16 minutes of footage, and while it has little to do with the film in reality (I’m surprised that Disney hasn’t thought of putting out a DVD documentary devoted to the stage musical itself), it is fascinating to see the work that has gone into making such an amazing show. Also here is an opportunity to check out some of the advertising for the production, in the Stage Musical Publicity Gallery. Animals takes Roy Disney back to his days as a filmmaker on the groundbreaking True Life Adventures. Here he presents featurettes on the various animals found with the Lion King story. Is this an educational exploration, or a shameless plug for Disney’s Animal Adventure Theme Park? You decide, but I found the archive footage of the animals on show to be quite good fun, and zippy intercutting with the Lion King feature moves things along nicely. One thing I found amusing, though I’m sure it was unintentional, was the attempt to place Roy “in” the Animal Kingdom Park, even though he looks safe and warm inside a chroma-key sound stage! Four clips are included, featuring Lions, Meerkats, Warthogs and Hyenas, as well as a very cool almost 6 minute featurette on Disney And Animals, which takes a look back to Walt’s creation of Mickey Mouse and the Studio’s affinity to animal pictures throughout the years. Featuring some great and previously unseen archive footage, this featurette really goes to town, touching on the True Life Adventures, the animatronics of DisneyLand’s Jungle Cruise, live-action features, and right up to date with Brother Bear – coupled with the other animal clips here, it rounds up another 18 minutes of footage. The final icon to explore is Timon and Pumbaa’s Virtual Safari, a more kid-friendly attraction, which features new audio performances from Nathan Lane and Ernie Sabella as they take you on one of two tours. Although the trips are fun, there really isn’t much to them, though every now and then the viewer is asked to pick a route. There are some very funny exchanges in here for children and adults to enjoy, and one must applaud the designers of this “game”, as it really has been put together very well, using new CG backgrounds as well as animation culled from the film. Light and breezy, but an excellent demonstration that, while many bemoan the fact that there aren’t enough features, there is a lot of thought, time and trouble that goes in to producing (some of) the Disney DVDs. The “player” is given one of three choices: one that will take them on a jeep safari through the jungle, one that will lead them off on a wild cruise, and another that playfully announces the coming of Lion King II: Simba’s Pride and Lion King 1½ to DVD, which does not forgo the chance to play you that Hakuna Matata trailer one more time! And…just when you thought you’d seen all that there could to be seen, it’s time to check out those Continents after all. Though each section contains content that you will have seen using the main screen icons, there are little extras to be found here as well. In Asia, there’s a hysterical Multi-Language Clip Reel carried over from the LD, which is basically a playing of the Hakuna Matata sequence in various languages. What’s new here is the great addition of being able to select each country’s favorite scene as their language is presented – very nice! International Release is a brief featurette that explains the thinking behind the dubbing on the Lion King’s various language releases and how it influenced the dubbing of subsequent animated films from the Studio. Galleries in this section include a look at the various multi-language Soundtrack CD covers and the posters for the Imax re-issue in several different countries. Neither Africa nor Europe serves up anything we haven’t seen already, though Australia does offer the 1½: Hakuna Matata trailer yet again, for those sadistic creatures that can’t get enough of it! North America, which is split up into the various places that Disney has sites at, has a feature on the DVD Sound Design, in the Burbank section, which looks at how the re-mixed Imax soundtrack provided the basis for the Enhanced Home Theater Mix on the disc. In Orlando, you’ll find another push for Disney’s Animal Park, with both a four-minute featurette and a more straightforward commercial/promo for their Animal Kingdom Lodge. There’s not much to see in New York that isn’t already covered in the Music section, but Glendale brings us quite a wealth of additional material. Mostly LD carryovers (though with new intros), a Storyboard To Film Comparison offers the full opening Circle Of Life sequence in split screen form, while three early concepts that were later changed in the final film are also seen: Timon And Pumbaa Find Simba is a slightly alternate take on how the duo decide to take Simba back to their jungle hideaway; Simba’s Presentation is a completely different start to the movie, which ran as a dialogue scene before Elton John and the Circle Of Life song proved such economical storytelling in its own right; and finally, Warthog Rhapsody was the original “no worries” song that used to sit in the place eventually taken by Hakuna Matata. 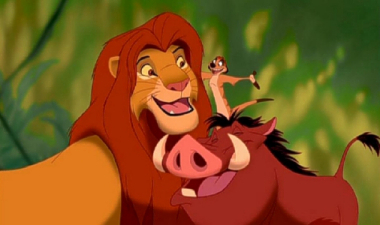 The song, although never animated, was storyboarded and recorded, later appearing on a couple of “jungle compilation” albums, and is rumored to be appearing in its entirety in a newly completed version in the new Timon and Pumbaa feature Lion King 1½ : Hakuna Matata. Some great concept work is showcased in an Early Presentation Reel that was shown to the various departments in the Disney corporation to herald production on the film, still then known as King Of The Jungle and with a projected release date of November 1993 (that space was eventually filled by Tim Burton’s The Nightmare Before Christmas, with the Lion King not being completed until the Summer of ’94). Finally in this section are a number of Art Design Galleries, which take in backgrounds, layouts and various sequences from the film. South America offers up the Multi Language Reel again, as well as a few previously seen galleries, but by now you’ll be repeating yourself (though not in the way that Pumbaa repeats himself, I hope)! All in all, I was impressed with the depth the features went in to, and the number of new interviews will please those with the LaserDisc sets. There is an argument for upgrading, especially for the new cut and sound-mix, but there was a fair amount of material (the Robert Guillaume hosted Making Of The Lion King, additional storyboard pitches and sequences) left on the LD that didn’t make it across (thus, I suppose, warranting the “exclusive” badge on that release’s back cover). Also missing, and with no explanation, are the number of trailers that announced The Lion King in theaters, nor any touching on the original DTV sequel, Simba’s Pride (a film that, as with the stage show, grew from the Rhythm Of The Pride Lands album). There were a few other instances of opportunities missed that I thought about while ploughing my way through the set, though to be fair, there is such a great deal on offer here that it almost seems trite to complain. However, as a disc that announces itself as the definitive account of the Lion King’s production, it does miss a few tricks – I guess we all want our cake and eat it too! Despite the fact that the Platinum line was originally created to showcase the ten most popular Disney features in the Studio’s line-up, I do not know of any other series that has been so maligned when it comes to its packaging. The first two releases in the series, Snow White and Beauty And The Beast both came in different styles of packaging, whereas The Lion King switches things again. Available in a simple, dual keepcase-style cover, which looks like any other two disc set on the market, real fans may want to go the extra mile and plump for the luxuriously assembled Collector’s Gift Set. Looking a little thicker than a box for a television season set (or roughly the size of two Extended Editions of the Lord Of The Rings series), this particular box comes with an additional wrap-around strap that advertises its contents, placed at the bottom of the pack, Disney Treasures style. Inside, in addition to the 2-disc set, you’ll find the DVD Companion Book The Lion King: Special Edition – The Journey, a hardcover volume that simply feels like quality. Featuring storyboards, concept art, production stills and final frame blow-ups, the book is cut in two halves: the first part being about the making of the film, the eventual stage show, the Imax and DVD restoration, and the theme-park inspirations; and the second being a re-telling of the story. The one drawback for me was the reliance on the final frames that fill the book, when the selected pencil-test and production art is so much more appealing and rarely seen that it would have been nicer to have more of these kind of illustrations that only pepper the book. It feels a little like a light edition of The Art Of… books that traditionally accompany the Disney features on theatrical release, but this is not simply The Art Of The Lion King cut down, but a whole newly designed “mini-coffee-table” book that offers up a new angle on the movie. Also included are nine Character Portrait Drawings, housed in a simple-but-effective black box. Very nicely presented in box-inspired frames, the nine characters depicted (each signed by their original animators) are Simba, Scar, Pumbaa, Zazu, Young Simba, Older Simba and Nala, Rafiki, Timon, and Mufasa and Young Simba. There are, in fact, ten sheets in the box, with the final one being a Certificate Of Authenticity which comments on the production of these lithographs by the Sleepeck Printing Company, who should be commended for the fine way they have carried over the quality of the animators’ work to these clean and crisp reproductions. As for the disc itself, it comes with the same outer packaging that graces the standard two-disc DVD version – so collectors are not missing a thing! Presented in the same manner as the Beauty And The Beast and Sleeping Beauty sets, the set comes with the Velcro-fastening slipcase holding the slim-line dual disc case inside. Again, stickers have been attached to this outer packing, so be careful when removing them, although Disney has been kind and used easy lift-off glue that does no damage to the case itself. Inside, you’ll find the disc box shrink-wrapped and ready to be opened! If you’re an adult handing this box to a child to open, please be warned that the inserts (which include the usual, and very nice, “disc navigation”/chapter index booklet) contain a huge amount of advertising for various trinkets that kids will see as “must haves”. Other than that, it’s attractive enough art for the standard edition, but the pack put together for the Collectors Gift Set wins top marks and certainly adds a great deal of excitement to the overall appearance. I bought the original LaserDisc pressing of this film back in 1995, and even then noticed that the 1.85:1 presentation cropped a slight amount from the VHS tape my friend had. 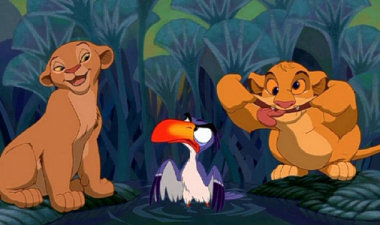 The Lion King was shot to a 1.66:1 negative, meaning that the sides were cut off on tape, and a little amount cropped for theatrical and widescreen home video release. Unlike Beauty And The Beast, however, this framing was more than adequate, and one could see the progression of the filmmakers learning curve as they began to frame for the wider image. The good news all round is that this transfer really has been spruced up. Taking its cue from the recently released Imax makeover, the original computer files were remastered for this new edition, meaning that it quite literally looks like a film that was released just months ago, instead of a ten-year old print. While we may not be getting the exact same theatrical version as we remember, there are few that could complain about the image on this disc. It’s simply eye-popping and stunning to look at, beating all previous home video versions. For once, we are actually given the aspect ratio that is advertised – this 1.66:1 transfer does indeed open up the sides from the cropped VHS issues as well as give a little more top and bottom. Everything is crisp and clear, and the little touch ups given to the animation throughout the film suddenly become worthwhile. Those with the LaserDisc sets may want to keep what they have though, as that original CAV edition will be the only way to see the true 1994 cut in the theatrical 1.85:1 ratio. This DVD presents the full 1.66:1 negative image in a fine anamorphic rendering, and should please any fan of the film! Apart from the standard Dolby Digital 5.1 and French language dub tracks, The Lion King heralds Disney’s latest “innovation”, the Enhanced Home Theater Mix. From comparing the big, loud action sequences, all I can say is…wow! Original sound mixer Terry Porter has created an amazingly enveloping mix that will shake your home theater, and it does everything it sets out to do. Switching between the already aggressive Dolby theatrical mix and the EHT one provides listeners with an instant difference in sound quality. In fairness to the Dolby track, I did feel that it was reproduced on the disc at a slightly lower volume to anything else (even the low spots in the menus seem to flood the biggest moments in the movie, sound wise), so the EHT mix will automatically sound louder anyway. But there is a spacious-ness to this new mix that I cannot explain technically, simply “opening up” the audio that much more, and providing a level of sound involvement that bests even a good DTS track. While some will bemoan the fact that DTS was not included here, the Dolby 5.1 tracks still pack a mighty punch, and 2.0 Surround versions are available for those with Pro-Logic amps. Better than them all, including any DTS remix that could be included, is the EHT mix, which will remain my default for this disc in the future. The nice thing also is that it is not tied to any individual version of the film – both cuts are available to enjoy in this new format! English subtitles are also included. It’s all about the extras, baby, and while this may not be the one-two-three punch that many were expecting, it’s a solid package and especially so with the additional supplements to be found in the Collector’s Gift Set. With Finding Nemo hot on Simba’s heels when it comes to the overall bottom line, we are reminded of the demise of classical animation and the majesty of efforts such as The Lion King. Such delights now rest with the direct-to-video crews, who have been given the thankless task of re-creating the Disney magic of old and re-serving it in ready to digest chunks: next up, a third Lion King, being a “mid-quel” that explains what happened before Timon And Pumbaa met Simba in the desert. All in all, I found it was a question of quantity over quality with this set, and though the clips are as in-depth as they need to be, it’s perhaps because I have seen much of the archive material on disc before, in the LD-issued set, that I did not find anything particularly “new” here. For those coming to all of this for the first time, there is a sense that much is included, but I feel that may be because of all the bells and whistles that have been added in the menus and in the carving up of the features between the many “locations” that are offered to explore. While not boasting the amount of material that meant a good few days going through the likes of Snow White, this does build on the slightly disappointing Beauty And The Beast set to deliver a little of something for all the audiences this is aimed at. Next up, as the promotional booklet inside announces, it’s the turn of one of my true favorites, Aladdin. Hopefully the Studio will continue to plunder the archives for original materials as well as new interviews. There was never a collectors’ LaserDisc of Aladdin, so any commentary for that will be new, and there should be a Cave Of Wonders worth of extras to enjoy (one can see the marketing now) that haven’t been seen since the film’s original 1992 theatrical release. The mix of old and new on this Lion King set just about works, though I never felt that there was enough of either. As a stab at hitting all the demographics this is likely to appeal to, it comes off a little short (I’d have liked a feature on the amazing vocal cast, at least), but is no less an exciting set. The Collectors’ Gift Set adds a lot to the overall package, and with the holiday season coming up, this will be an instant buy. Perhaps not a mighty roar then, but certainly not a whimper either! Lion King animator Tony Bancroft takes “warthog”’s share on Pumbaa!